For 30+ years Proclaim Promotions founder has been providing Retailers of all types with innovative and productive Visual Marketing Displays and Programs that build their brand and drive location visits. 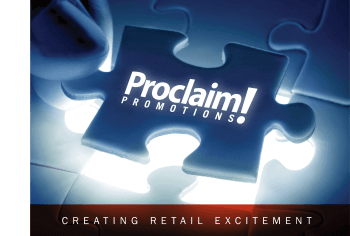 Proclaim will become your hands and feet in the field executing Promotions on time and on budget. We also develop all-inclusive programs that take the repeat ordering out of the equation as Proclaim handles the updates and change-outs on your schedule.